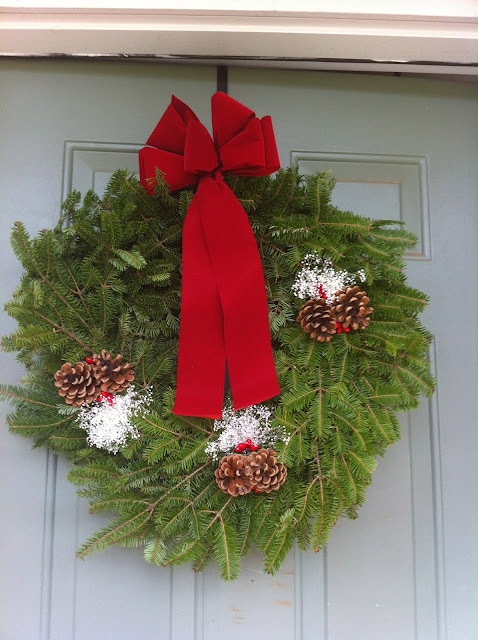 Packed inside so beautifully was my fresh Balsam Fir wreath from Wreaths of Maine! 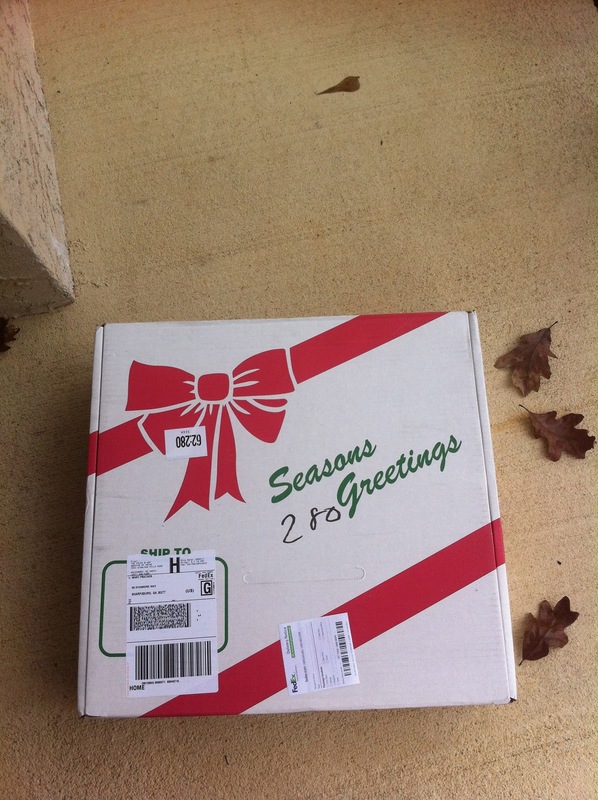 It was 78 degrees outside, but it felt like it was below freezing when I took it out of the box and smelled that aromatic Christmas scent -- you know the one... Christmas is coming! 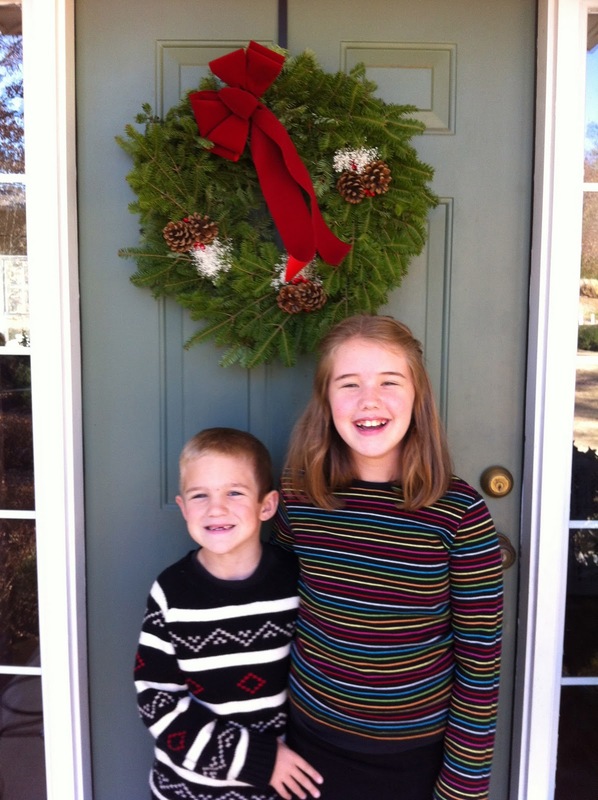 It is such a treat to have a live Christmas wreath this year, and I think it looks beautiful on my front door (the kids are pretty cute, too!) It spans nearly the entire width of my front door and looks beautiful from the street. Now, here's the best part. I received this wreath for FREE from Wreaths of Maine to review for The Old Schoolhouse review crew. Just a handful of reviewers received one (you can read more from them at the crew blog), and I consider myself very lucky to have been chosen. There is also good news for you as a homeschooling family. 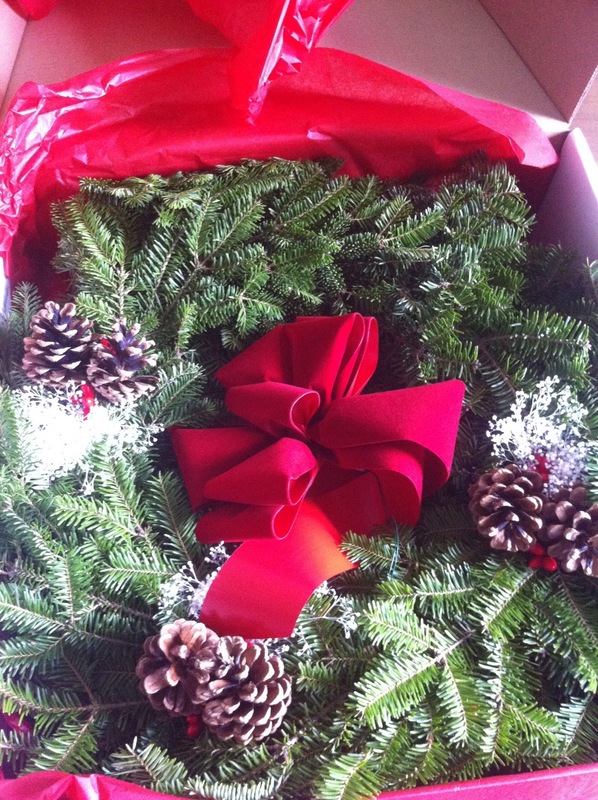 These gorgeous Christmas wreaths are part of a homeschool fundraising program from Wreaths of Maine. The Wreaths of Maine homeschool fundraising program is a simple way for homeschool families to earn funds for those things you might desperately need - or for those things that just might be really nice to have! "First, you need a sales packet containing useful information, as well as tools to help sell Wreaths of Maine. Using the color brochures to show the wreaths; you will earn $6.00 for each wreath sold (except the $29.50 Homestead wreath: you will earn $4.00). October is a great time to sell to businesses. Some students have had great success selling to stock-brokers, insurance agencies and real estate firms. All of November, and especially Thanksgiving weekend, is an excellent time to sell wreaths in your neighborhood or to visiting relatives. A demonstration wreath is available for $27.00. Because of the Balsam fir and weather conditions, demo wreaths are shipped the 1st week in November. Once you show a sample of the fresh Maine balsam wreath with it's aromatic scent, people are anxious to order one for themselves. Customers fill out the invoice, one for each address. They can also add a message to be placed on a gift card when sending wreaths as gifts. Checks are made out to Wreaths of Maine, or customers may pay by credit card. Wreaths of Maine processes all the payments for you. The invoices and payments are mailed to us each week in dated envelopes provided in the sales packet. The last day to send us orders is the Monday, after Thanksgiving; at which time, you also send the sales record summary. The commission check arrives the third week of December; in which, you will be reimbursed your sales packet cost if you sold more than 10 wreaths. You will also get a free gift if you sold over 15, plus you earn $6.00 per wreath!" What I love about this is that you don't have to go door-to-door. You can encourage your family, friends, and co-workers to buy a wreath from you -- and for wreaths ranging in price from $31-$42, that is a very good buy. I also love that people can send them as gifts... the gift card included is simple and elegant. I also found the communications from Wreaths of Maine to be simple and timely. You can contact them in a variety of ways (see below) for questions or concerns you may have. From reading their Facebook and Twitter stream, they receive many compliments on their service and products, and you can't ask for more than that. It was my pleasure to complete this review -- thank you to Wreaths of Maine for brightening my home this holiday season! You can visit Wreaths of Maine at their website. Read what my crew mates are saying about The Wreaths of Maine Fundraising Program at the crew blog. This was a unique opportunity for us, so I'm sure you'll read some reviews from very happy people!